Benelli's The Fowl Life follows host Chad Belding through America's flyways in pursuit of meeting and connecting with the American Hunter. Chad continually learns that waterfowl hunting is the common denominator that brings him and so many friends, new and old, together each year. Viewers are welcomed into each part of the journey from the pre-season preparation, long road trips, tips and tactics, world-class duck and goose footage, and behind the scenes of duck and goose camps across the country. Mother nature truly is the backdrop of The Fowl Life and each and every episode is directed towards showing humility and admiration for her and all of her creatures the team hunts. Join Chad as he learns what it means to be an American Hunter, and all the walks of life that encompass it. As a young boy growing up, Chad Belding was introduced to the outdoor lifestyle by his father Orville. On opening day of the 1997 Nevada duck season, Chad sat in a blind with a few close friends. Soon the gadwalls began their morning flight, and when his buddy lured the grey ducks in range with a perfect sequence of hen calls, and the boys opened up, well, that was it-he was hooked on waterfowl hunting. Straight out of college, he began owning and operating several businesses based out of his Reno, Nevada, offices. After assembling one of the most accomplished and knowledgeable staffs in the industry, he created Banded Nation. This venture now includes Outdoor Channel show "The Fowl Life" and varmint hunting program "Dead Dog Walkin'", both produced with his brothers Clint and Clay. Then came the formation Banded Brands, a waterfowl related product company offering clothing and gear for the hunter. In 2014, Banded was purchased by Arkansas based Banded Holdings, Inc. The next year in 2015, Memphis, TN, based Avery Outdoors and their brands Greenhead Gear and Avery Sporting Dog was added to the Banded Holdings portfolio. "I think one word that sums up all our success is passion," Chad said. 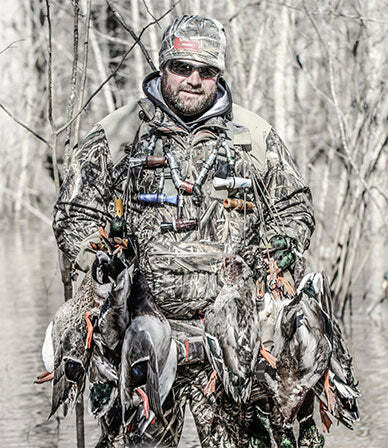 "Our passion is what I feel like has made us a powerhouse in the waterfowl industry. People appreciate how we hunt. We're always joking around and smiling, but we're also serious about it, and we're good at it." The future is certainly bright as Chad continues to evolve "The Fowl Life" and his other interests, keeping them relevant for his great team of partners and sponsors. For more information on Banded Nation, visit www.bandednation.com.